Otoplasty risks and complications rarely take a serious turn. In fact, the main Otoplasty risks could be due to anesthesia complications – and this is the reason why the surgery is normally done under local anesthesia. General anesthesia is used only when otoplasty is performed on children. Its low ear surgery complications rate has resulted in Otoplasty being done on an outpatient basis. People with prominent ears or ear protrusions are often subject to social ridicule and bullying. This can have a negative effect on the psyche of the individual, especially children. If the problem of prominent ears causes serious social and mental anguish, then such patients will be ideal candidates for surgery. Ear surgery complications normally rise with a corresponding rise in the patient’s age. The ear is fully developed by the time a child is four years old and therefore, the time between 5 years and 14 years is regarded as the ideal time for Otoplasty. The ear will be malleable and surgery will be easier, posing fewer pinnaplasty risks. However, older patients also undergo Otoplasty with extremely good results without any Otoplasty risks or problems. Children will experience milder pain when compared to adults post Otoplasty. This is because the nerve supply to the ear is much better developed in adults and therefore the pain will be more intense. Undergo a complete medical check-up to get a status on your over-all health. Inform the doctor about any regular medication you may be taking and follow the advice given. Do not take medication like ibuprofen and aspirin before the surgery as it can cause bleeding – which is one of the potential Otoplasty risks. Avoid tobacco and alcohol for a week before the Otoplasty procedure as this will delay the healing process and the skin redness may persist. Possible signs of infection include swelling, redness, pain and drainage. If any of these warning signs are present, do consult your surgeon immediately. The chances of infection post-otoplasty are rare and this is because the ears are well supplied with blood and this reduces the chances of infection. Also, most doctors prescribe a course of antibiotics to be started immediately after the operation in order keep infection at bay. However, if any infection does set in, it has to be treated immediately with additional antibiotics in order to prevent damage to the ear cartilage. Otoplasty involves adjusting the height, width or inclination of the ear auricles. The surgery that is most commonly carried out is to set prominent ears to the back of the head. This may involve ear shaping or size modification too. There is a danger of overcorrection if the procedure is performed by an inexperienced or unskilled surgeon. This would leave the patient with ears too close to the head or with a distorted shape. The risk can be mitigated by choosing a well qualified, experienced surgeon. Bleeding during Otoplasty is normally minimal. Some patients experience the formation of blood clots during the first 48 hours. 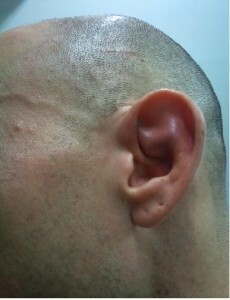 The excess blood should be quickly removed or it could result in ear deformities. The blood clots may be removed with a needle. It’s important that your surgeon is informed of these developments. The ear is made up of cartilage that has a lot of elasticity. Therefore, over time, some patients may see that the effects of the Otoplasty are slowly being reversed as the ears shift back to their natural shape. A revision surgery is possible. The ears are pinned back or the shape is modified and held in place with the help of sutures. Sometimes these sutures may pop or loosen up causing the ear to go back to their normal position. This risk can be lessened by avoiding contact sports and vigorous physical activity for some time post otoplasty. A period of around six weeks is considered ideal for ear surgery recovery. The incision during Otoplasty is normally done in the natural crease behind the ear. If the suturing is not properly done, there could be some scarring. However, an experienced surgeon will be able to minimize the risk of scarring due to his sheer skill. Patients needs to be fully aware of such Otoplasty risks before going in for otoplasty surgery, so that they can make an informed decision. This entry was posted in Otoplasty and tagged ear surgery complications, Otoplasty risks, pinnaplasty risks by Zipheal Editorial Staff. Bookmark the permalink.